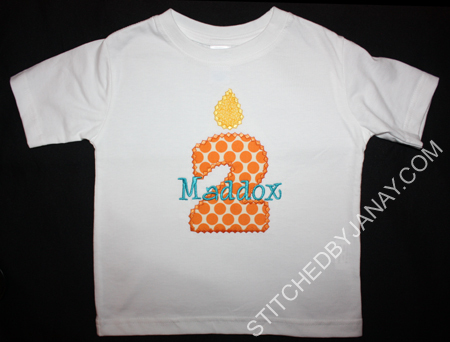 Maddox turned two and his mommy asked me to make a birthday shirt for him. Now, for those of you who know Katie, that might come as a surprise -- she is an EXCELLENT seamstress, and has an embroidery machine of her own! 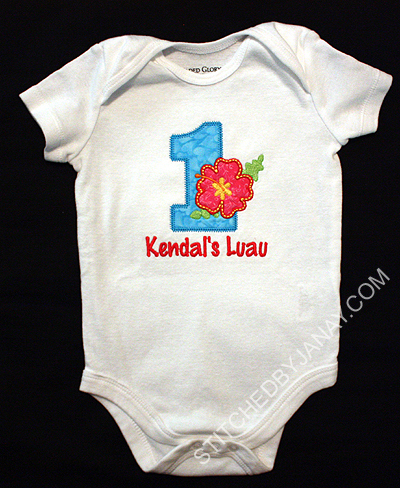 But for now she's limited to a 4x4" field and wanted a bigger design for his birthday shirt. I was happy to oblige! Katie wanted a candle number with his name, so I suggested the same combo I used last year for Grant, the Applique Birthday Candle Numbers and Whoa Nelly both from 8 Claws and a Paw. Katie supplied the shirt and fabric, so this was pretty quick to make! Poor little Maddox ended up being pretty sick on his birthday :( but he's feeling better now and I saw him wearing his shirt tonight at church. Such a cutie! Brittany's husband is a contestant in a strongman competition this weekend, and she wanted something special for her daughter to wear. 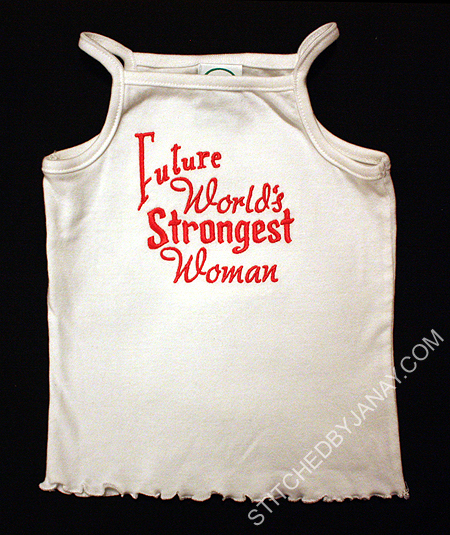 She requested the text, "Future World's Strongest Woman." Now, I could have just used one of my Embird alphabets to type out the text and stitch away, but of course I didn't take the easy route. :) Even though I haven't purchased or stitched a single one, I love all the text embroidery designs that have become popular recently, so I tried my hand at using multiple fonts from 8 Claws and a Paw to create a typography-like design and I love the results! "Future" is the Diner font. I used an envelope in Embird to give it it's shape. "World's" and "Woman" are the Alexis font -- I wanted them to look elegant. 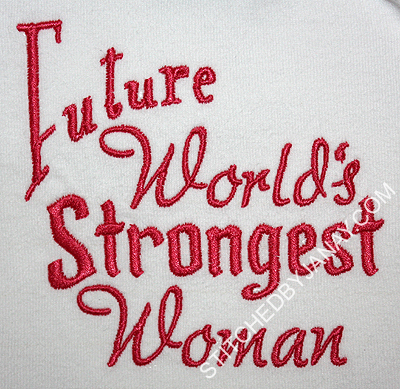 "Strongest" is the Cinderella font -- I wanted it to be bold but not boring. 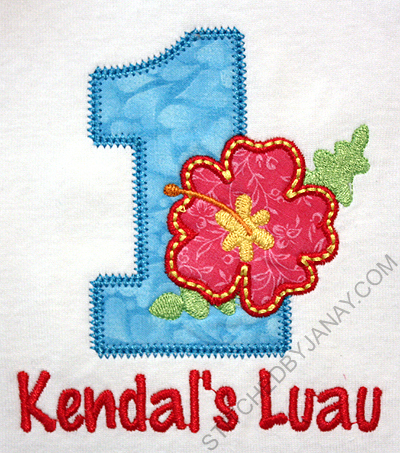 I used my fave Chubby Wubby Applique Numbers from GG Designs and merged the hibiscus from Planet Applique's Tiki Alphabet on top of the "1". I added the text with Embird Alphabet #8. Michelle ordered the onesie and skirt from Old Navy and then I got to work. 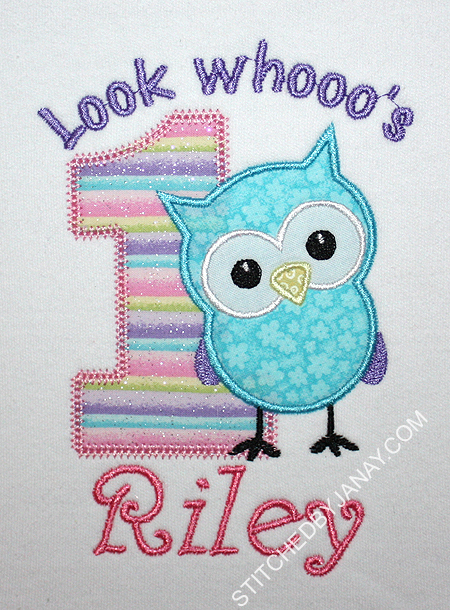 I first of all tested the whole design on a bib, it stitched perfectly, and then I moved onto the onesie. I used Embird Alphabet #8 for "Look whooo's". 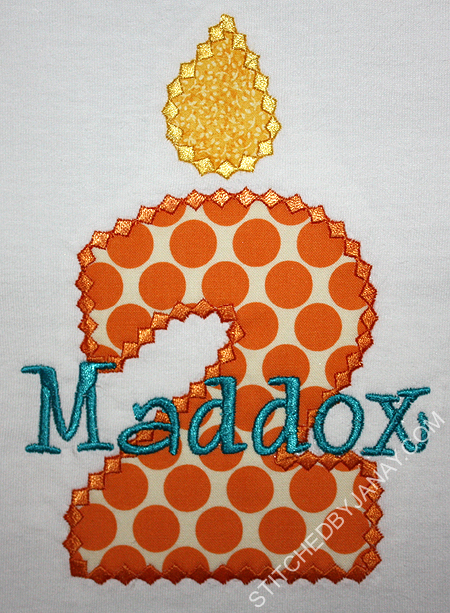 The "1" is from Chubby Wubby Applique Numbers from GG Designs, and I used the Chez font from 8 Claws and a Paw for her name. Now, the applique owl design is not yet available. Sheila is busy getting all of her ducks in a row before launching a site (probably this summer). So hang on, it will be available before you know it. 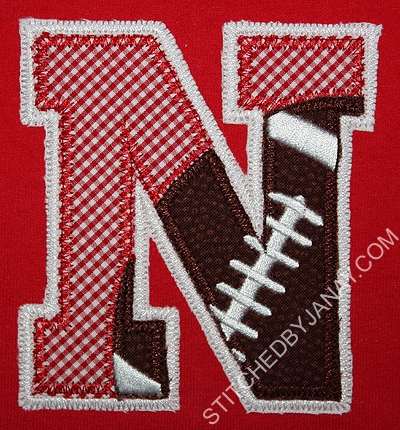 Until then, you can become a fan of Savvy Stitches Applique on Facebook. 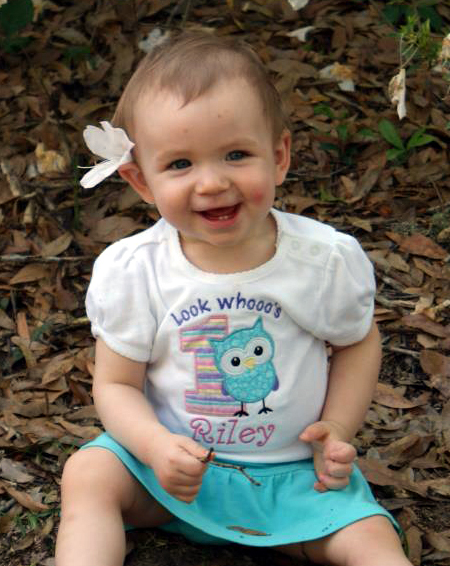 Thanks Sheila for letting me be a tester so I could create this cute shirt for Riley! 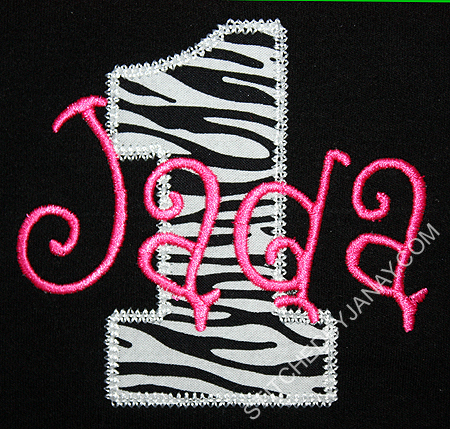 The "1" is from Chubby Wubby Applique Numbers from GG Designs, and I used Miss Kitty from 8 Claws and a Paw for her name. 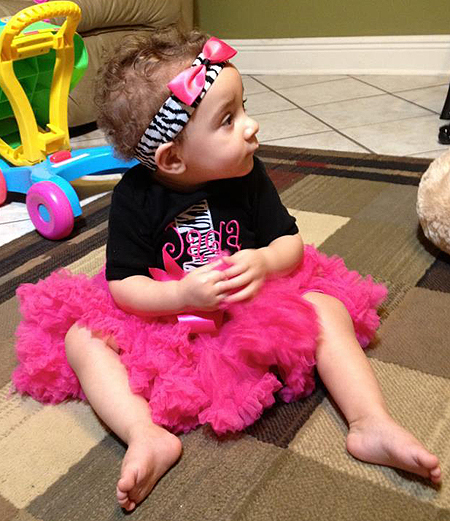 Here's Jada all decked out for her party, check out that precious headband and pettiskirt! What a cute ensemble! 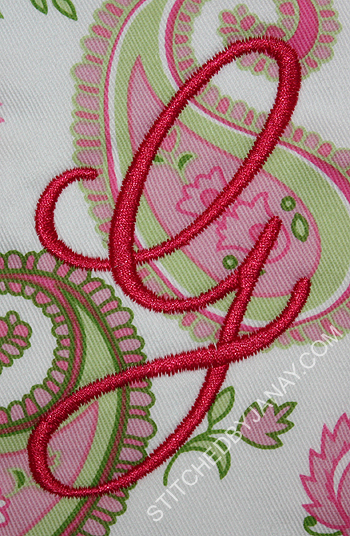 Here are a few random items that I simply added a monogram to. 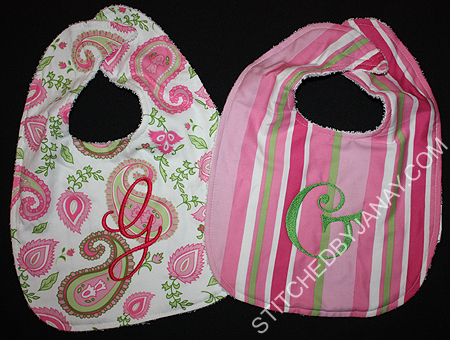 First up, some lovely bibs that my friend got as a baby shower gift -- they just needed a little G on them, easy peasy, right? Well... except that capital Gs often look WEIRD, so it took a while to decide what I wanted to use! The paisley bib is so lovely that I went with a more scripty fancy G. I used Stella from 8 Claws and a Paw. 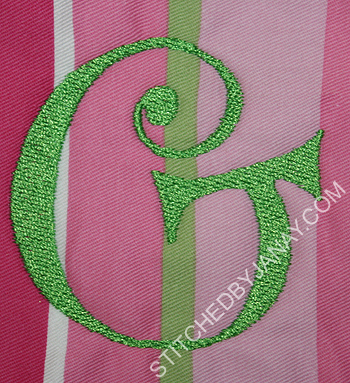 For the striped bib I decided to go with a more traditional looking G, but one that is whimsical. This is Pizazz from 8CP. 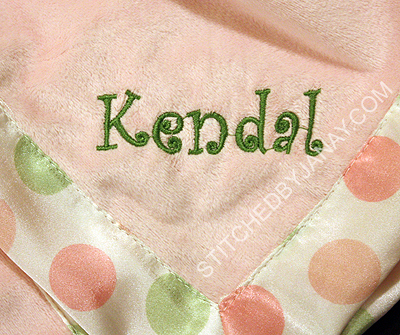 And finally I monogrammed these little kitty blankies. My friend's daughter has one that she ADORES and must have with her at all times. Her mommy was SMART and bought a couple extras to add into the rotation, that way little Kendal is never without one. 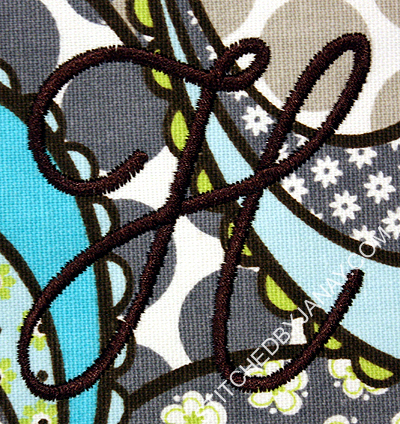 :) I used Embird Alphabet #17 to match the original blanket monogrammed in Curlz. 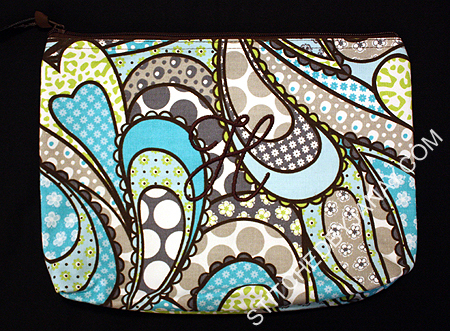 On it's own, the curlz font is very thin, and I was afraid it would get lost in this super soft fabric. So I finally had the bright idea to increase the pull compensation on an Embird alphabet -- WOW I wish I had thought to try that years ago! 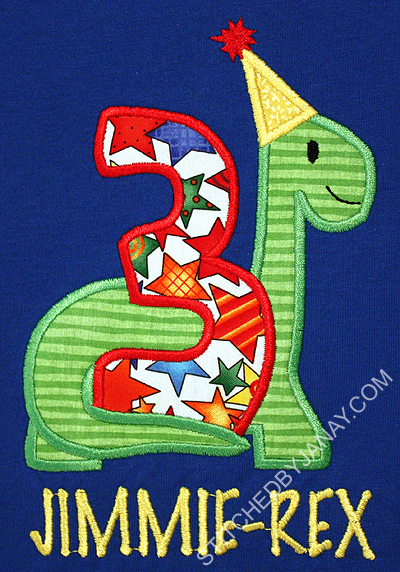 Sue requested a birthday shirt for her grandson, suggesting a dinosaur holding a "3". I immediately thought of Original Stitches' Apatosaurus design and ran to her site. She only had the "1" design listed, so I asked on her Facebook page if she had plans to do additional numbers. She quickly responded that she'd be happy to do the 3 design, and within a couple days had a design ready for me before I was even ready to stitch it! It turned out so cute!! Thanks again, Erin! 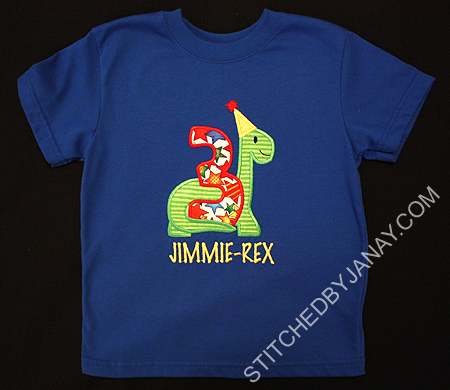 I added "JIMMIE-REX" with Embird Alphabet #8. 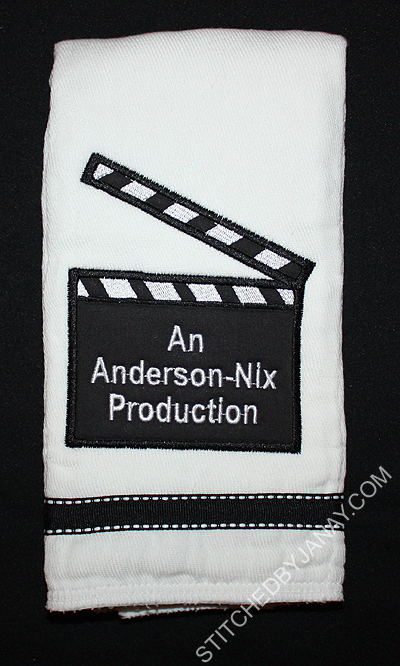 Daddy got his degree at FSU film school, so my husband's first request was to bring this clapboard idea back out of my archives. :) I used Lynnie Pinnie's Movie Marker design, deleting out the text it comes with and inserting my own with Embird Alphabet #2. Isn't this ribbon perfect? Makes me think of film! I was going to stop there, but since we now know the baby's name, I decided I just *had* to personalize something else, and chose a bib. I had a sweet design all ready to go when my husband said it would be hilarious if I could incorporate some sort of delivery truck. He and the daddy have some running gag going on at work about delivery trucks... so here you go. Odd, yes, but if it makes Daddy laugh, I suppose that's what's important. :) And it turned out to be a big hit! I used Applique Momma's Ambulance design, deleting out several elements to make it a plain truck. I added the text with Embird Alphabet #2, and used my favorite Whoa Nelly font from 8 Claws and a Paw for Shepherd. Ok, I'm sure that makes you think my husband works for UPS, but he doesn't. 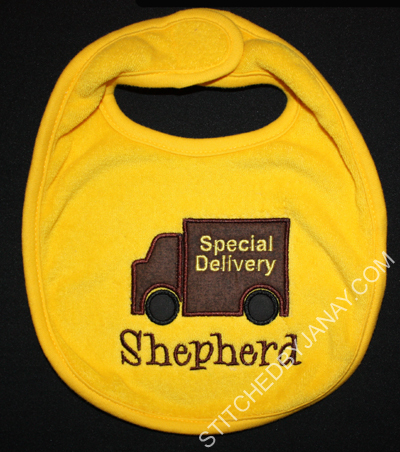 In fact, he works for Onyx, and the company gave Shepherd a little onesie with their brand on it. This year for "Take Your Lil Dot to Work Day" Shepherd can join in the fun! Oh how I love making truly one-of-kind custom gifts! !